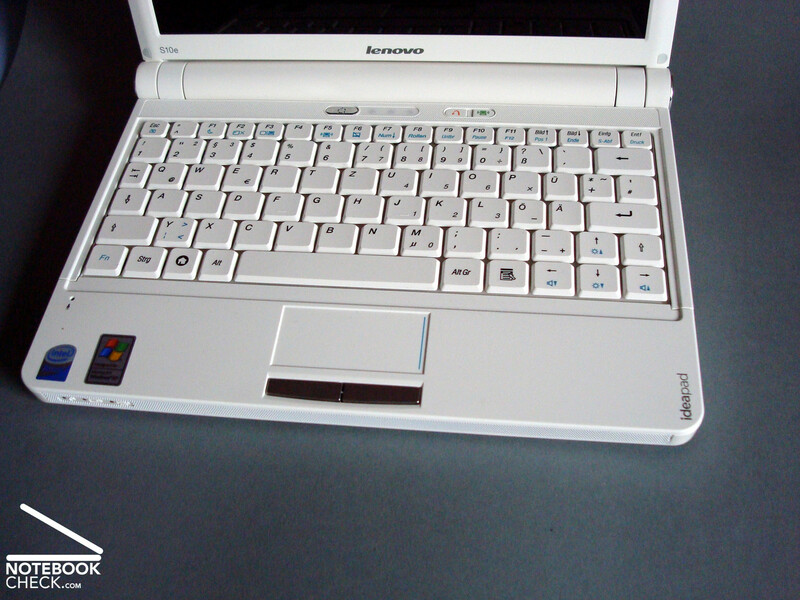 Alike nearly all big and small manufacturers also Lenovo has various netbook models, which have to assert themselves in the highly competitive market, in its product range. The competition pressure is high, the margins are small and the commonly used Atom platform gives only little leeway to get ahead in performance. Launched rather late, the Lenovo Ideapad S10e tries to attract potential buyers by a stylish look and some smart ideas. Our test sample had a noble white finish, which was nearly used all over all surfaces. Only the trackpad buttons, the power switch, and the outer parts of hinges' covers have a silver metallic look and slightly attract attention. In general, Lenovo offers the S10e in five different colors, but, only the black, the white, and the red model are available in Europe to date. We still have to wait for the blue and the glossy pink model. 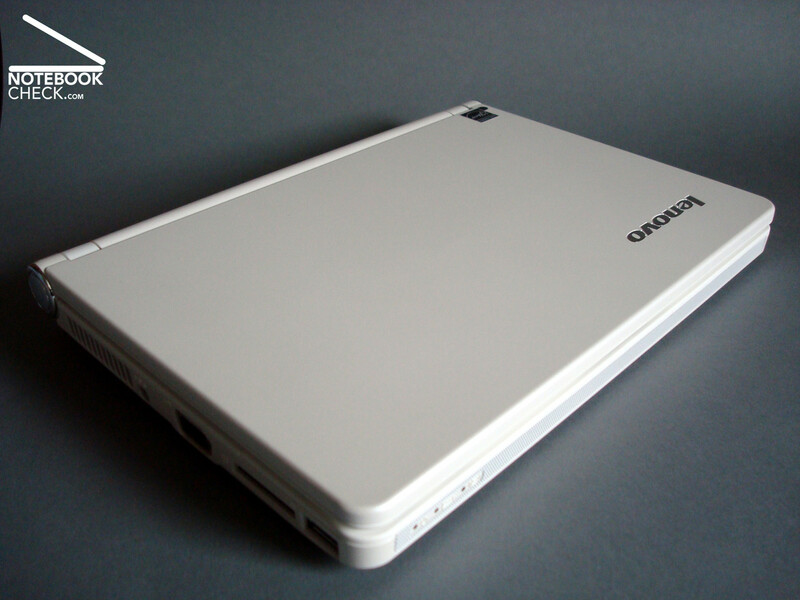 The case is with a size of 27.5(H) x 250(W) x 183(D) millimeters and a weight between 1145grammes (3-cell battery) and 1290 grammes (6-cell-battery) good average in the 10 inch netbook category. Furthermore, it appears to be quite slim compared to the more chunky looking competitor models. The 6-cell battery has a slightly negative impact on these aspects. It increases the total weight by about 145 gramme and lifts the back by about 10 millimeters, so, raising the total height to 37.5 millimeters and resulting in a wedge shape. The 3-cell-battery, which is included in other models, is flush with the case and does not lift the back of the chassis up. However, its battery life is shorter. 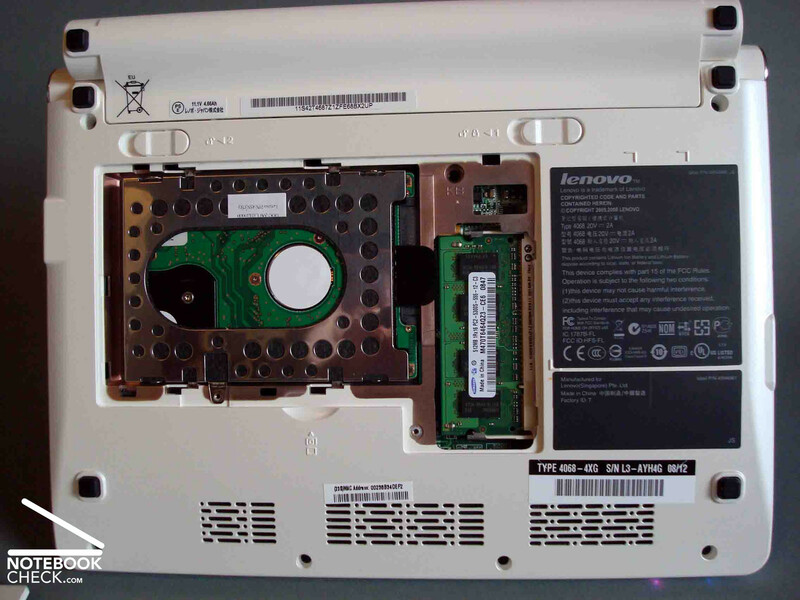 Regarding the used surfaces, Lenovo distinguished inner and outer parts. While they used a slightly roughened surface, which feels nice to the touch, around the keyboard and the screen, the display lid and the bottom are more glossy. They are of equally high-quality, but depending on the color slightly more sensitive to fingerprints and dust. So, far, the white color proved to be a good choice, because fingerprints and dirt do not show that much. The design of the case proved to be pleasingly robust. It is difficult to find torsions, uneven gaps, or creaking. The same is true for giving of the pressure-resistant surfaces. Only the part above the cardreader, which is on the left side, appeared to be a little bit weak in our test sample. A visibly bigger gap, a giving palm rest area, and a giving keyboard hint on a marginally less ideal substructure in this part. Altough the lid is not that torsion-resistant that the chassis, it gives little reason for critique. The relatively small frame does not only look good, it also copes well with the protection function without any recognizable disadvantages. Although everything can be slightly flexed and pressed, the operation is not affected by for example distortions. 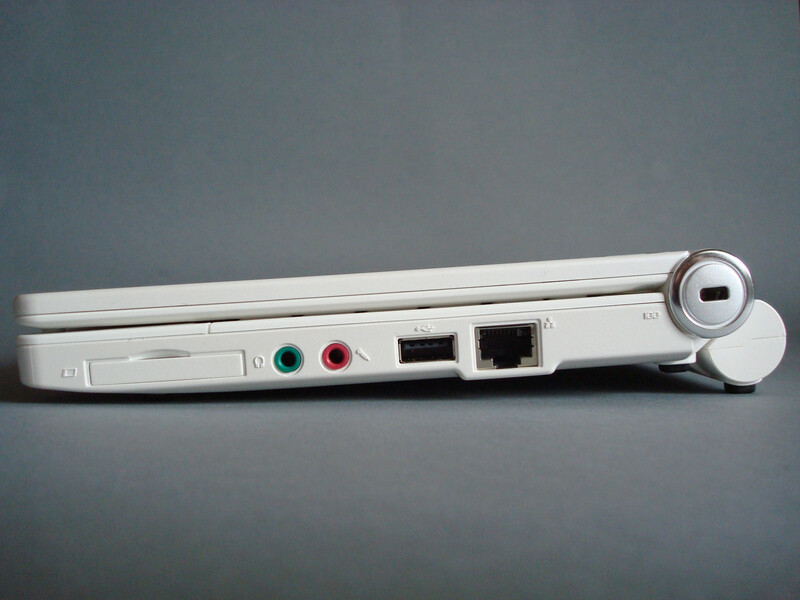 Lenovo does it without a closing mechanism, which should keep the lid closed. Instead the fairly tight display hinge is responsible for this. It can cope with its principal duty, supporting the display in any position without luffing, with easy. Funny enough, this rigidity is disadvantageous on opening or closing the lid, because it is hardly possible to do this with one hand. Furthermore, the lid and the base unit do not close flush. Plastic pimples spread around the display frame keep it about one millimeter in distance (narrowest part) and allow small objects to penetrate between display and keyboard. At least, this prevents the keyboard from leaving marks on the display after a while. 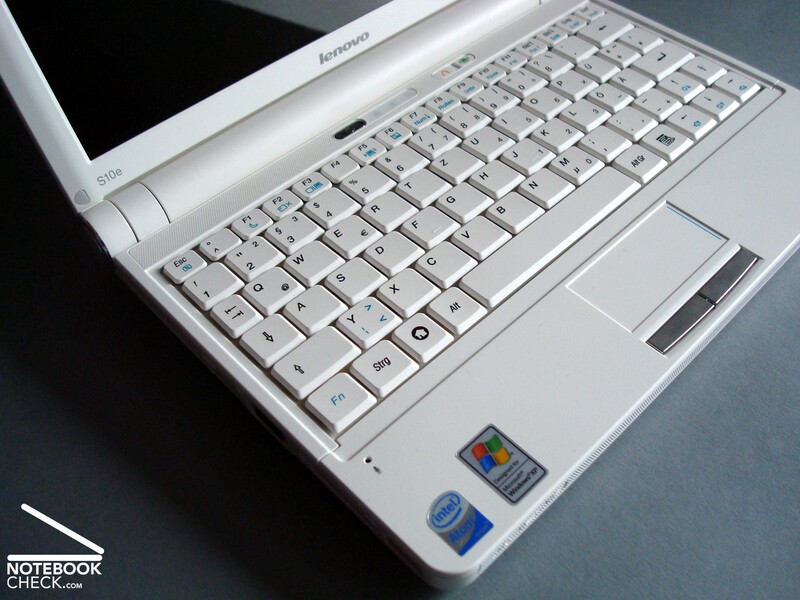 Because the 6-cell battery is included in the delivery the Ideapad is somewhat jacked up. 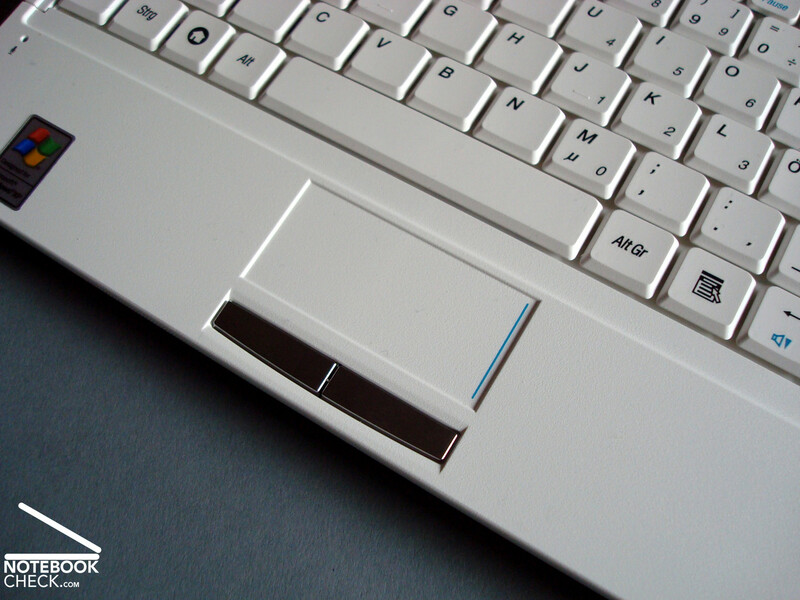 The lifted chassis does not only improve the hand posture during typing, but also ensures that fresh air can get to the bottom side and therewith helps cooling the system. Because the 6-cell battery limits the opening angle, it could have, depending on your sitting position, a negative impact. However, we did not have any problems with that throughout our test. The bottom side looks neat and has with three vent holes and a cover nothing special at the first glance. 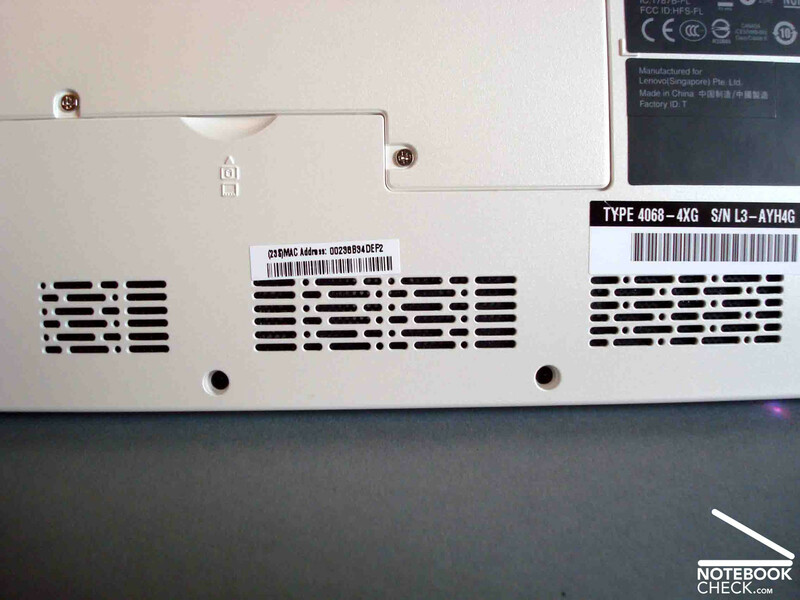 But, once you unscrewed the two screws holding the cover and remove it, you will find one special feature - well, actually two beside the ExpressCard/34 slot. The good news: It is easy and quick to replace the hard drive. The bad one: Lenovo fixed one of the RAM modules and, so limited the maximum RAM capacity to 1.5 gigabyte instead of otherwise 2 gigabyte. 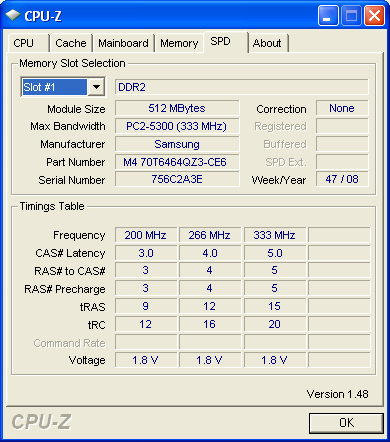 The top RAM module can alike the hard drive easily be accessed. To summarize, maintenance is possible in an easy and exemplary way. 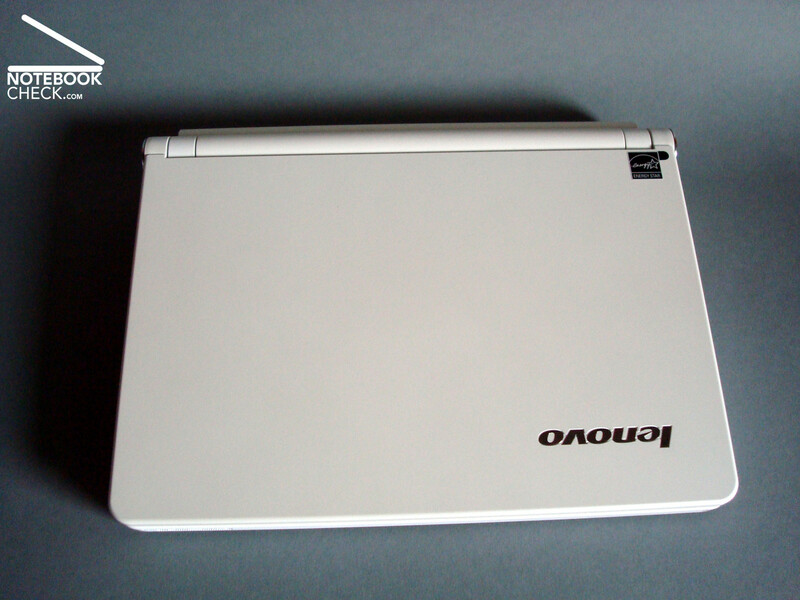 Alike in many other netbooks, also in the Ideapad S10e the battery completely occupies the back side of the case and, so, has a somewhat negative impact on the connectivity. 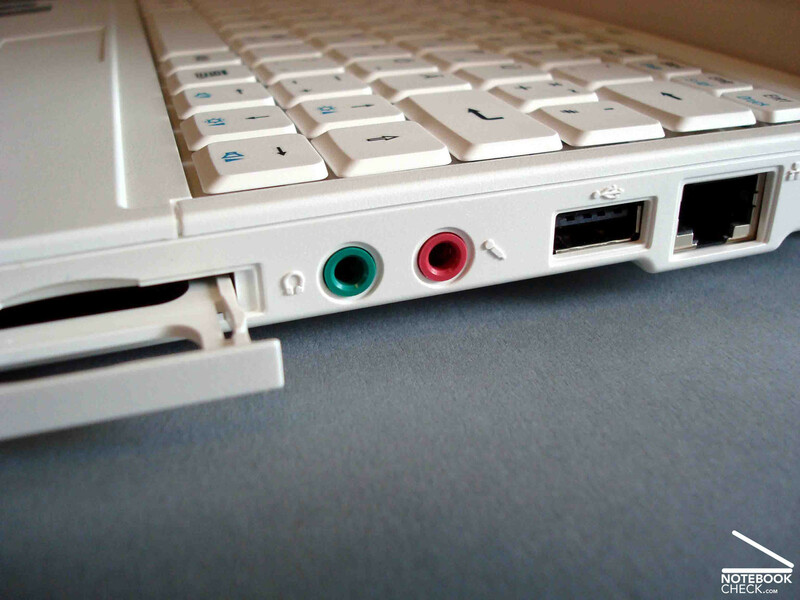 Even smaller jacks like, e.g., DC-in or USB 2.0 do no longer have enough space there and where located on the flanks. 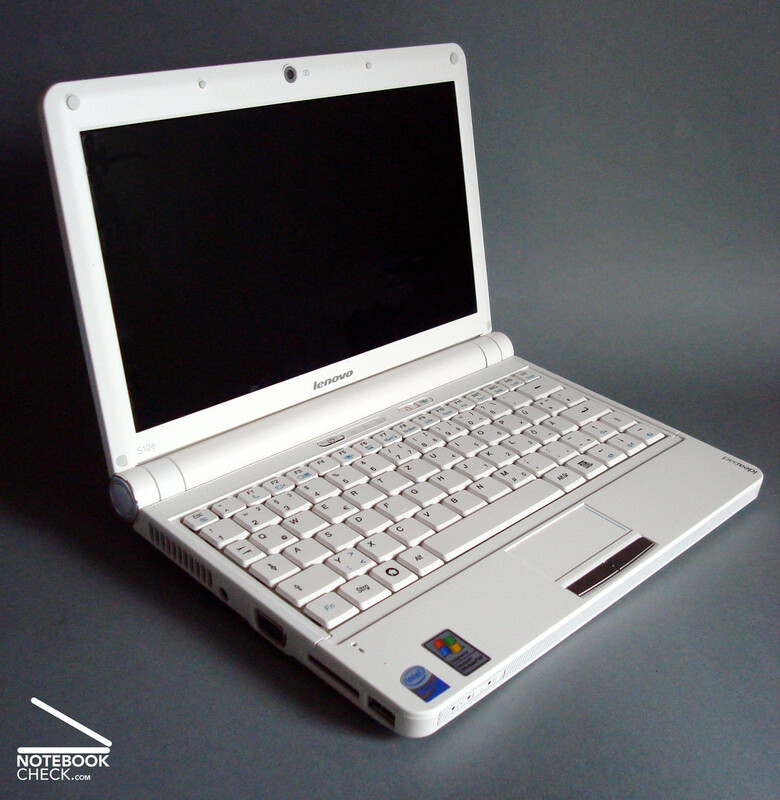 However, there you'll find everything common in netbooks: VGA-out for external screens, audio, ethernet, card reader, DC-in and 2 times USB. 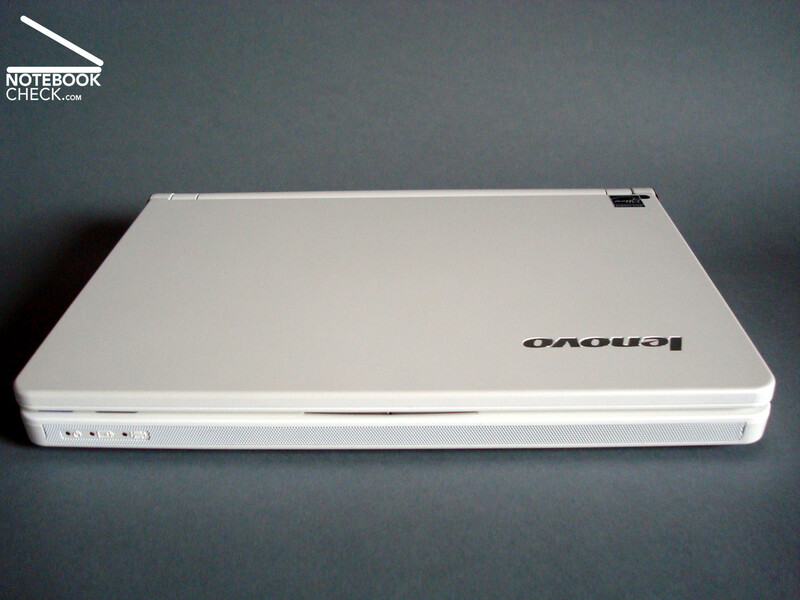 While some might not like to do it without a third USB port, Lenovo provides an ExpressCard/34 in return. 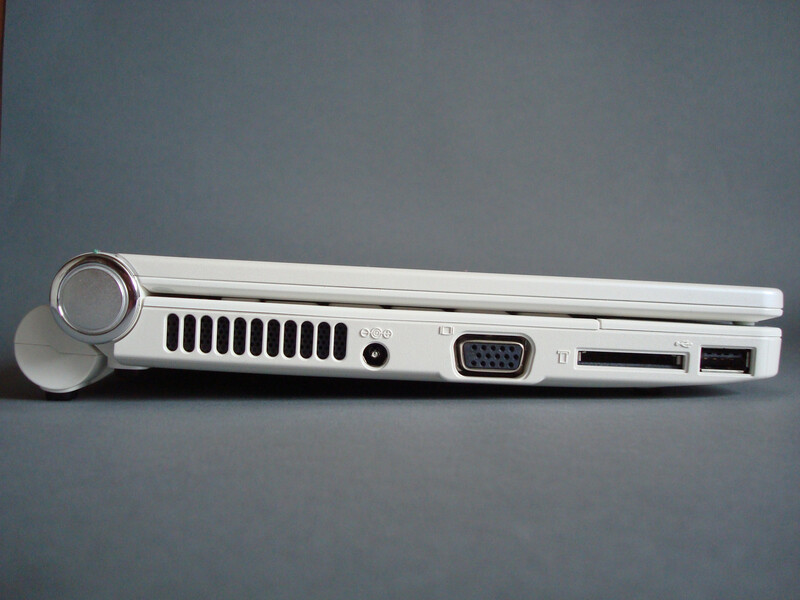 This expansion slot, which is somewhat uncommon in netbooks, makes it on the one hand possible to enhance the this netbook with standard interface (FireWire, eSata, or UMTS) and on the other hand also with exotic hardware, like, e.g., the Genua GeNUCard security solution. 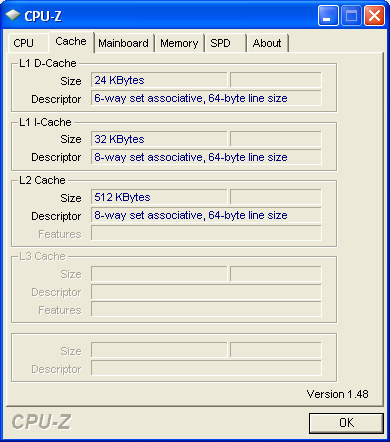 The location of the interfaces needs some time to get used to and can be depending on the usage a limiting factor. While only an inserted ExpressCard could cause problems on the right side, the left side is quickly crowded in stationary use. 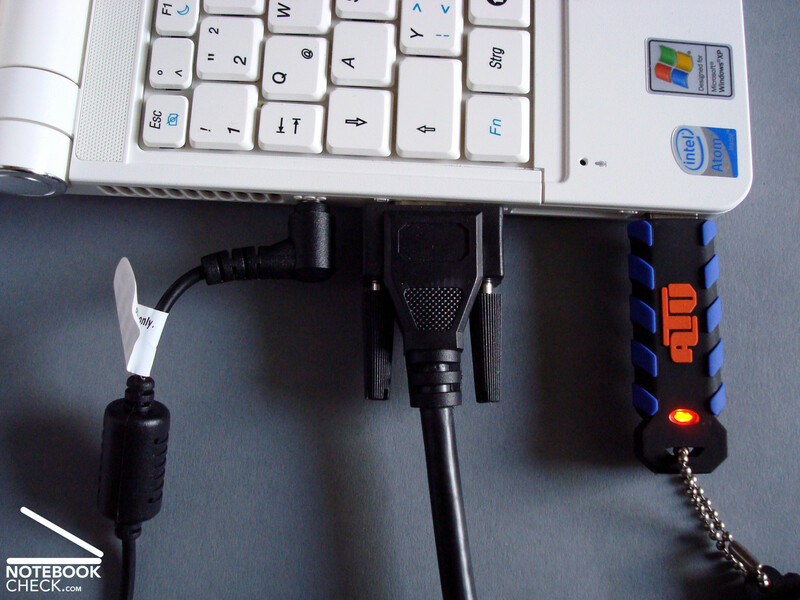 VGA, power cable, card reader and especially a USB port near the front, quickly cause a tangle of wires. 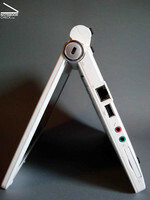 Because this is an intrinsic problem in nearly all netbooks, this is an inherent limitation, which has to be considered. 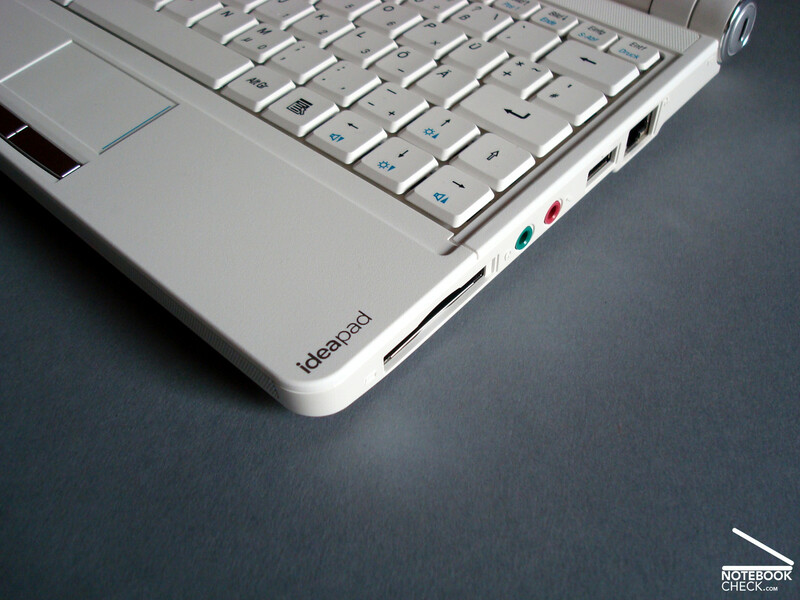 The Lenovo Ideapad S10e is well equipped with wireless communication modules. 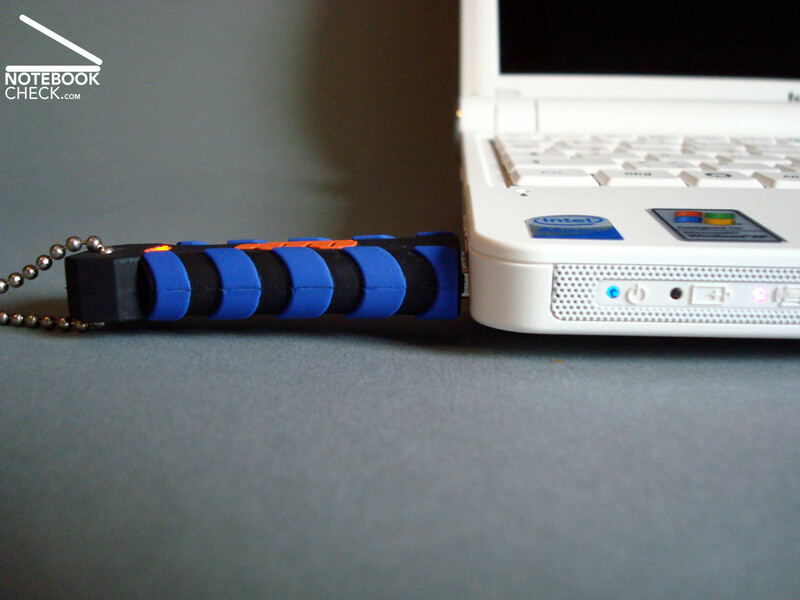 W-LAN and Bluetooth are on board of the test sample and should provide a sufficient connectivity most of the time. User who appreciate a UMTS module will unfortunately be disappointed. If you require one, you have to fall back on third-party suppliers and, so, to a UMTS-USB-stick or a UMTS-ExpressCard/34. 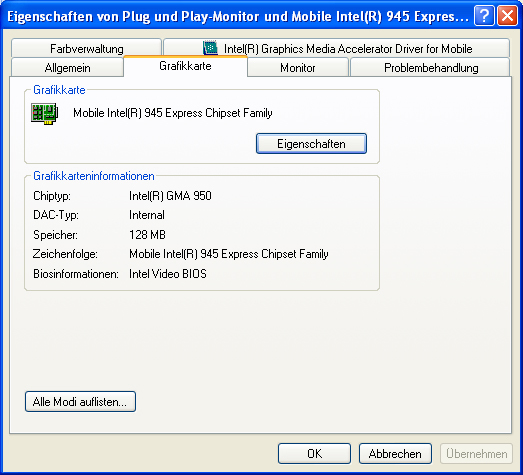 Some useful information to USB is also available here (in German, to be available in English soon). Regarding special accessories: Lenovo offers a 2-years and a 3-years pick-up-and-return warranty option (about 30.-/80.- euro). The already mentioned 3-cell and 6-cell batteries (about 70.-/76.- euro), and a 2-color neoprene notebook sleeve (20.- euro). The keyboard of the S10e left an ambivalent impression. Although the keys are compared to competitors like, e.g., the Eee PC 1000H, marginally smaller, it is quite comfortable to type with. We liked the soft feedback and the medium key travel, and also the good point of pressure with deep yet decent tapping. Chance or intent...? 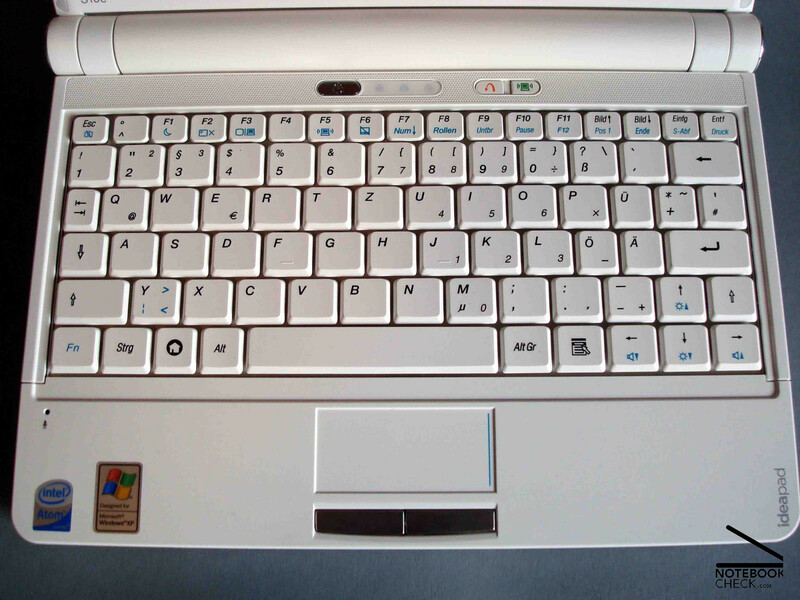 The return key which is nearly double sized and therewith sufficiently big, stands out by an especially soft cushioning, which should meet frequent use. The, as we think, clearly too small tabulator key, which is absurdly one of the smallest keys in the layout, requires improved hitting precision. 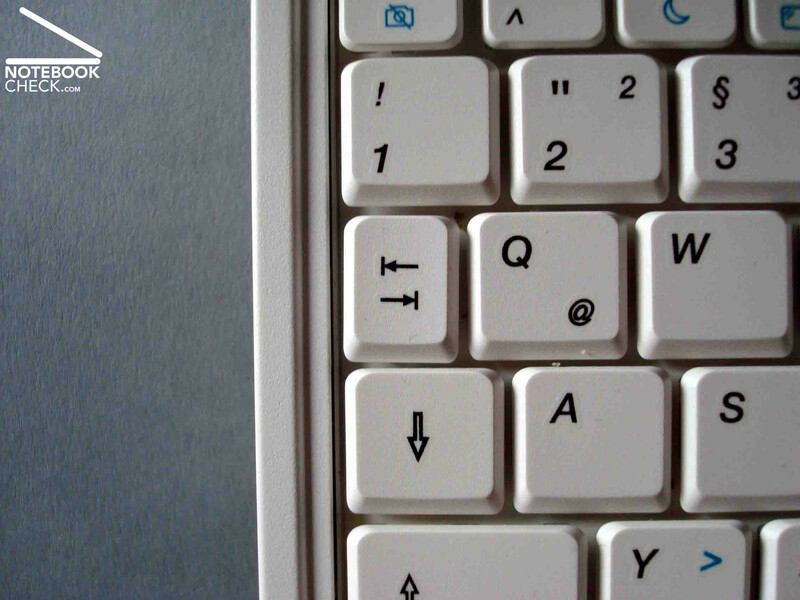 Furthermore, we need to criticize the order of the cursor-up and the shift-key on the right side. These often cause faulty operation like marked text parts and line skip and need some time getting used to. If you frequently work on different machines, this might cause problems again and again. 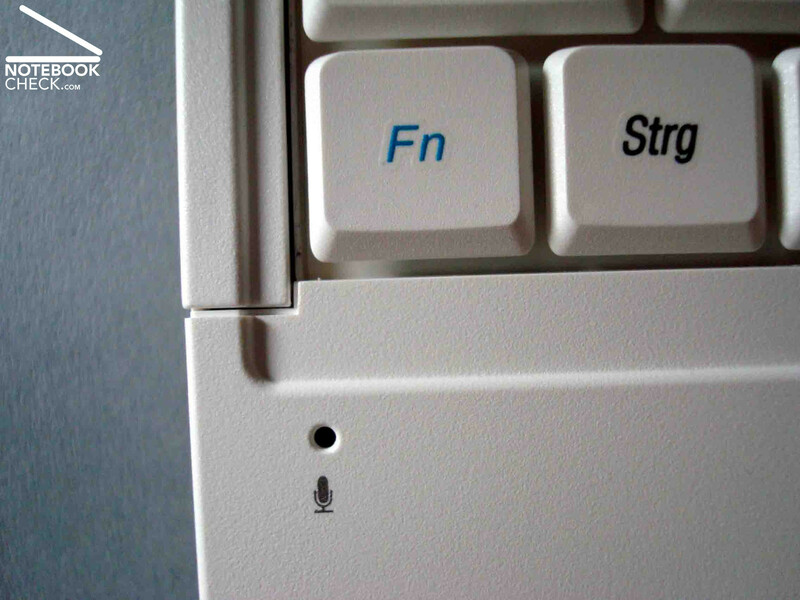 Also uncommon, but less restricting is that the FN key was moved towards bottom left and that F12 has to be emulated by FN+F11. 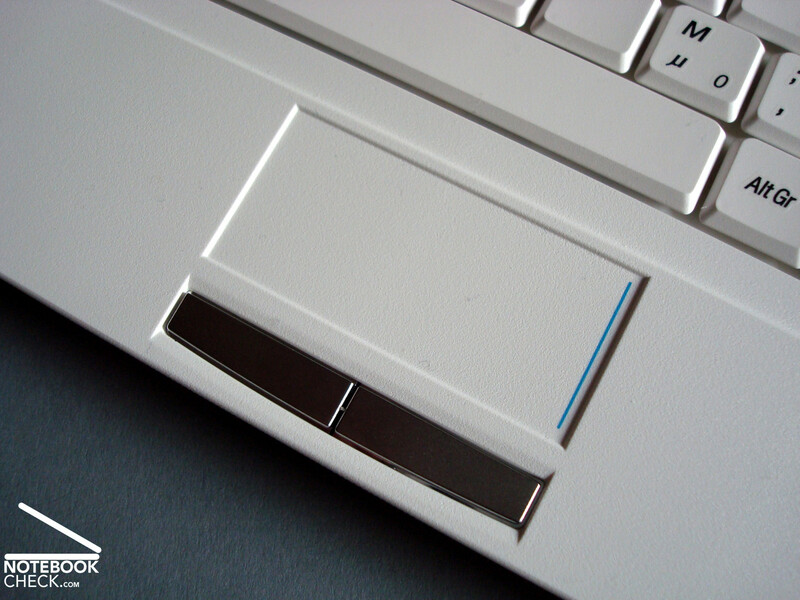 The somewhat small touchpad, whose borders are quickly exceeded, is due to its roughened surface comfortable in use and offers a good sensitivity. Although it needs to apply a little more force and precision to activate scrolling, this is only a little bit restricting after a short time getting used to. The two rather stiff touchpad buttons convince just like the keyboard by also having a good point of pressure and a full yet clearly louder noise. However, they could be bigger for large hands of men. Against all rumors, which circulated in the Word-Wide-Web before the launch of the S9 and S10 Ideapads in Europe, Lenovo finally chose a display with reflecting surface instead of a matte one for models available over here. On the contrary all Ideapad S models available in the US have a matte display. This factor causes heavy reflections in bright environments if dark pictures are displayed. While this effect can be moderated indoor by choosing an appropriate sitting position and by adapting the lighting conditions, this nearly rules outdoor operation out. This shortcoming is even aggravated by an only moderate brightness of 168 cd/m² in average and a low contrast of 150:1. In addition colors seem, for a glare-type display, also dull, because of this. Furthermore, changing your sitting posture, also results in a loss of saturation or inversion. On the other hand, the illumination is with measured 84.9% good and formation of shades are not discernible, even not with the naked eye. Another disadvantage of this display, which we uncovered in our test, is the 16:9 WSVGA aspect ratio, which means a resolution of 1024x 576 pixel. Omitting 24 pixel rows might perhaps have some advantage for watching films (pocket sized cinema), but in daily use there is even more need for vertical scrolling than already through the low resolution. We can say that the 10.1 inch display has a good viewing angle stability in vertical direction, where first distortion, like fading and,if you continue, inversion of colors, do appear before 50 degrees. In vertical direction you can already observe clear changes of the picture at small deviations of the perpendicular viewing angle. So, you'll frequently have to adapt the opening angle. 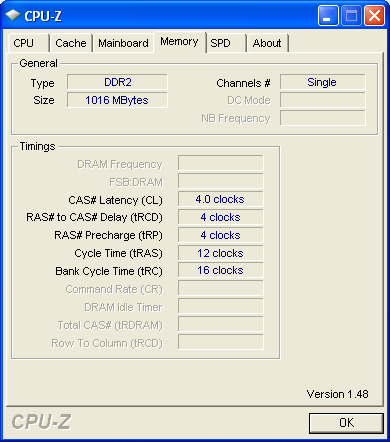 As already mentioned above upgrading RAM is restricted to 1.5 gigabyte instead of 2 gigabyte, which would be supported by the chipset, by one fixed RAM module. 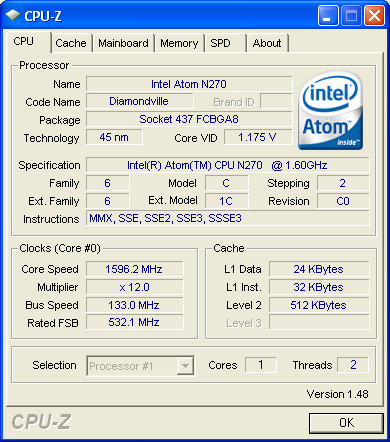 The 2 times 512 megabyte DDR2 RAM and an Intel Atom N270 (1.6 GHz) CPU do not raise any doubt, that the performance is about level with competitors. 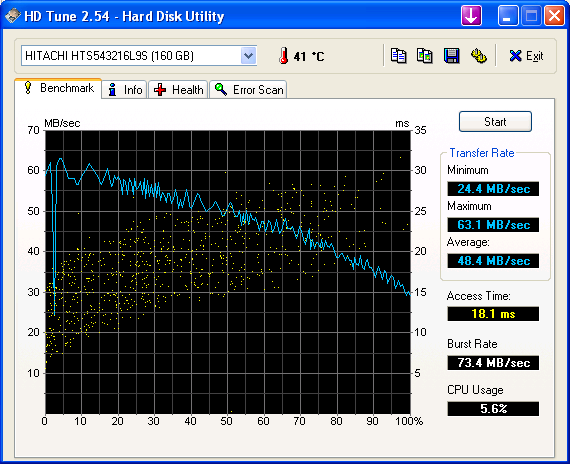 Although the Hitachi 160 GB hard drive with 5400 rpm does with an access time of 70 MB/s not achieve the netbook top values of the Asus 1002HA, the transfer rate of 47MB/s is on the same level than the one of the contenders, Samsung NC10 or LG X110. 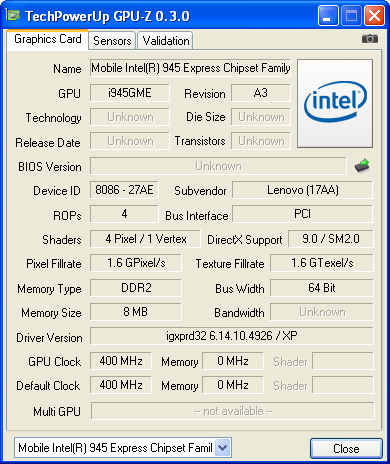 The well-established Intel GMA 950 with 400Mhz GPU-clockrate and up to 128 MB DDR2 shared-memory copes with all tasks on a level typical for this category. Nothing special is discernible in the OpenGL shading and 3D Mark 01 and 03 benchmarks. 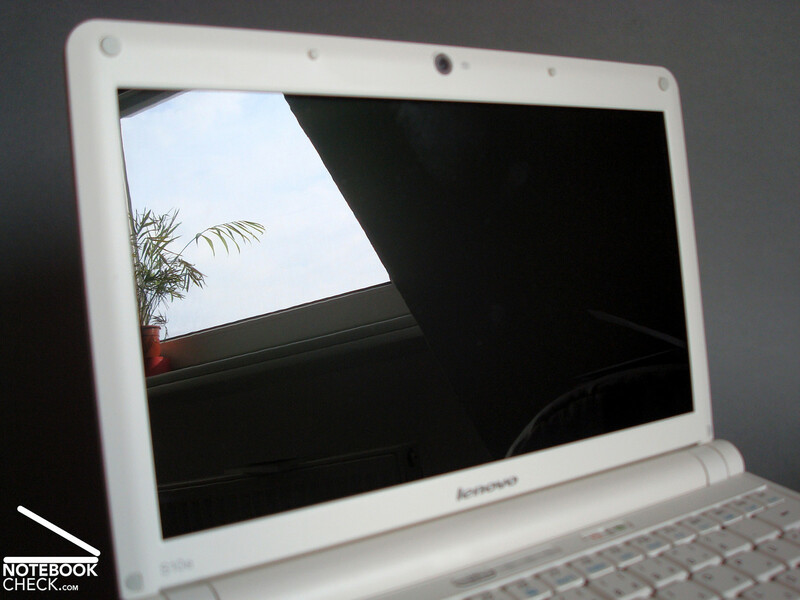 Overall the Lenovo fulfills the musts regarding performance and cannot get a leap ahead of the competitors. Subjectivelly, all tasks like office, browsing the internet, undemanding picture editing, music management, and watching films can managed trouble-free and sufficiently fast. The noise emissions are within the average of the category and can be called very restrained in daily use. The usually hardly audible system noise of 28.7 dB(A) is only sometimes interrupted by hard disk access (30.3 dB(A)), and a fan, which very seldom and very quietly starts running (30.3 dB(A)). Under average load, the noise level is only insignificantly raised to 30.5 dB(A). If you run the Ideapad at capacity, which is seldom in practice, it can finally get with above 38 dB(A) uncomfortably loud. Working with Photoshop 7 Elements was quite annoying as the fan was frequently switched on and off. 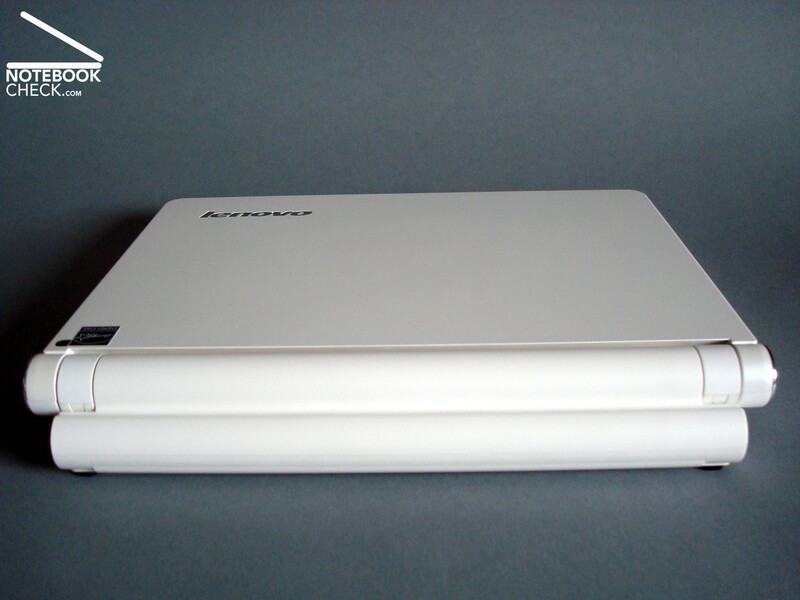 Similar to other notebooks, using an SSD as mass storage device could further decrease the noise and therewith allow nearly silent working with low and medium load. An attracting alternative could also be the hybrid model of the S10e with 4 gigabytes SSD and 80 gigabytes hard drive (NS82JGE). However, this model is only equipped with a 3-cell-battery. With low temperatures around 30 degrees Celsius at the keyboard area and a little bit higher temperatures on the underside, the temperature emissions cannot be criticized in any way. 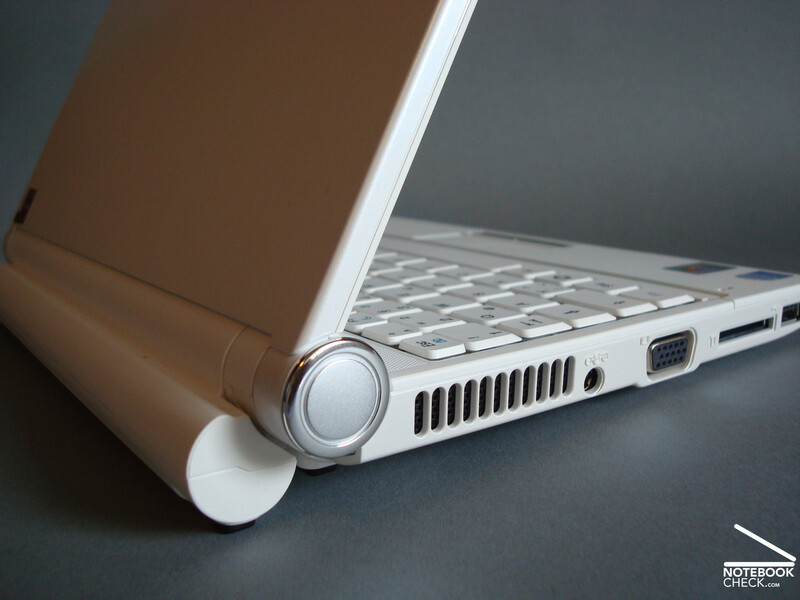 Using this laptop on your lap is just as trouble-free as on the desk - provided the vent holes are not covered. (±) The average temperature for the upper side under maximal load is 32.2 °C / 90 F, compared to the average of 29.8 °C / 86 F for the devices in the class Netbook. (-) The average temperature of the palmrest area of similar devices was 29.3 °C / 84.7 F (-3.5 °C / -6.3 F). The sound of the two frontally built-in 2-Watt loudspeakers is not really convincing. While the weak-bassed and treble-heavy sound is already little attractive at low volume, it even worsens by a subjectively tinny sound if the volume is raised. On-the-go it is recommendable to use MP3-headphones in order to increase the comfort of your ears and of others. 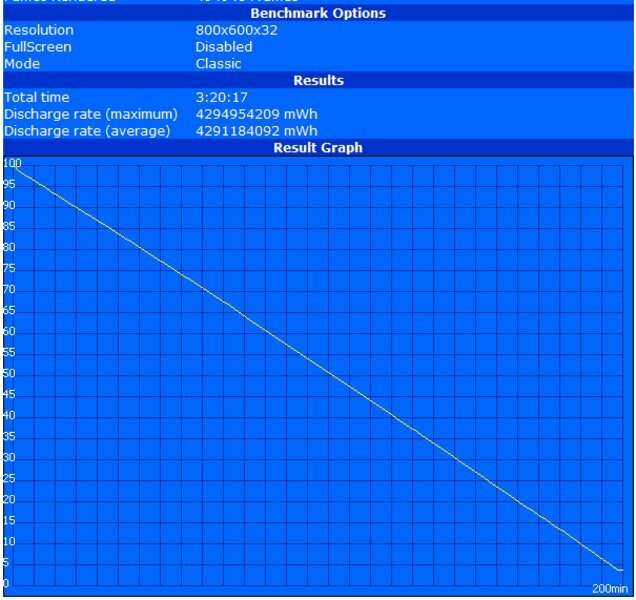 In the Battery Eater Reader's Test an average runtime was achieved. Our test sample accomplished with the 6-cell battery (52Wh) a runtime of 319 minutes in the Battery Eater Reader's test, which emulates reading texts, at minimum brightness and with all energy-saving options on. This correlates with an energy demand of 10W and only insignificantly deviates from the manufacturer information of 5.5 hours. 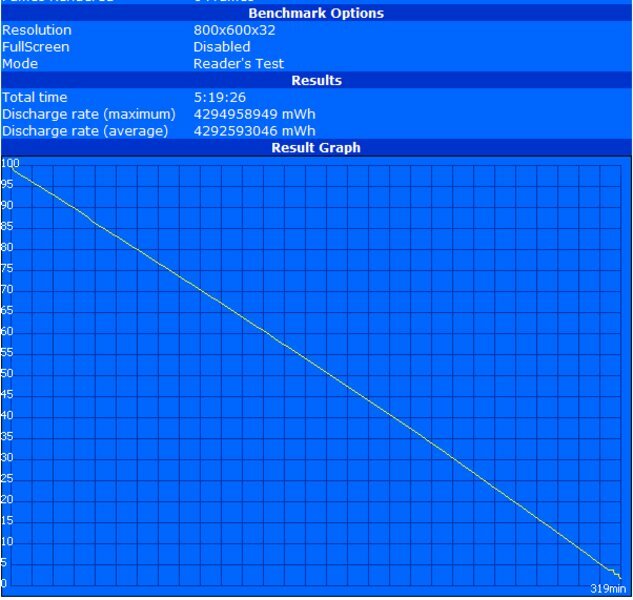 In the Battery Eater Classic test, which permanently applies full load, and at maximum display brightness, the Ideapad still works for 200 minutes. Isolated these values seem high, but directly compared to long-life notebooks, e.g., the Samsung NC10, this gets relativized. The positive first impression, which the very chic look gave us, could unfortunately only partly be confirmed at a closer look. Actually designed for mobile use, the restraints you have to accept are, depending on your individual preferences, more or less important. 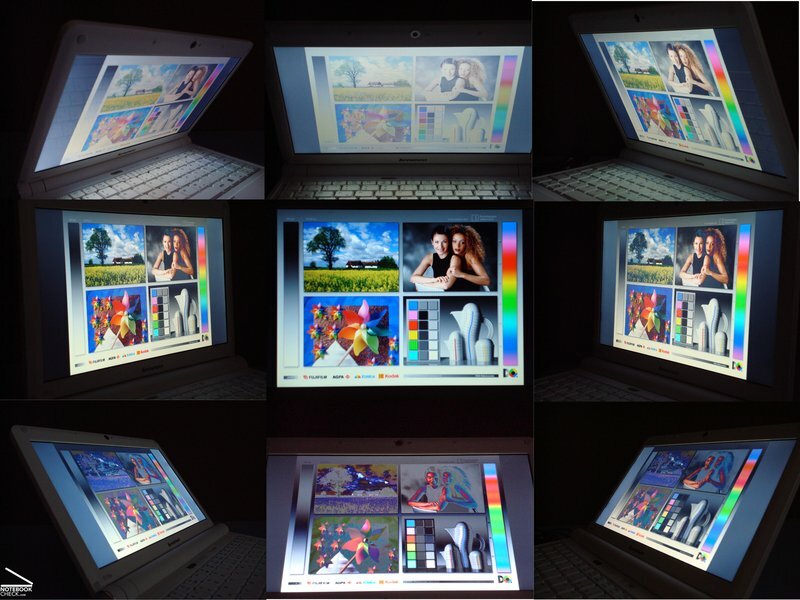 The main point of critique is the glossy display in reduced 16:9 aspect ratio, which comes up with an average brightness and good illumination. However contrast and colour representation are less vivid. Because of the too low average brightness outdoor operation is hardly a possibility. Also indoor you have to permanently watch the lighting conditions and live with a high viewing angle dependence. While the total weight of nearly 1.3 kilogram with 6-cell battery is similar to other netbooks, it cannot keep up with well-established competitors, which often provide six to seven hours battery life. The partly compacter size and the sleek look cannot outweigh the disadvantages in mobility. 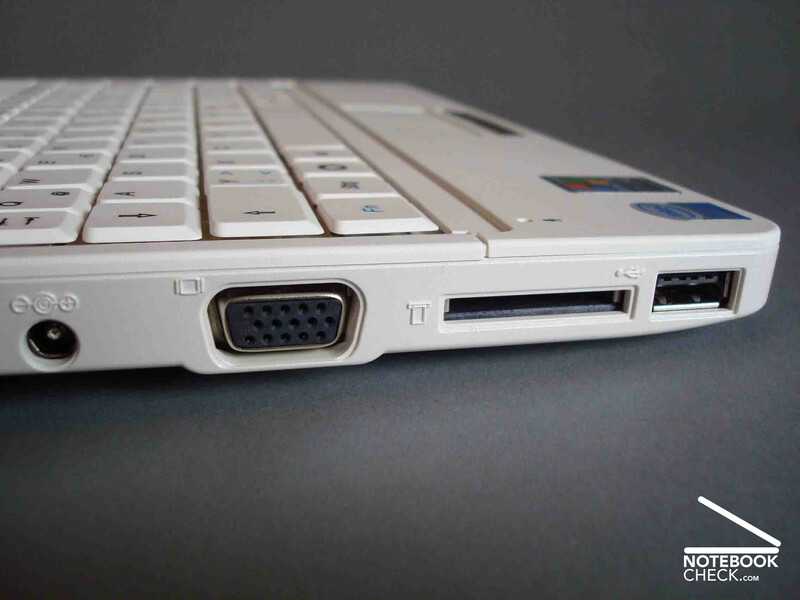 The somewhat stiff display hinge, the sinistral giving keyboard construction, the uncommon keyboard layout, the USB port close to the front, and the RAM module fixed in the first slot are disadvantages, you can, depending on the field of operation, live with. 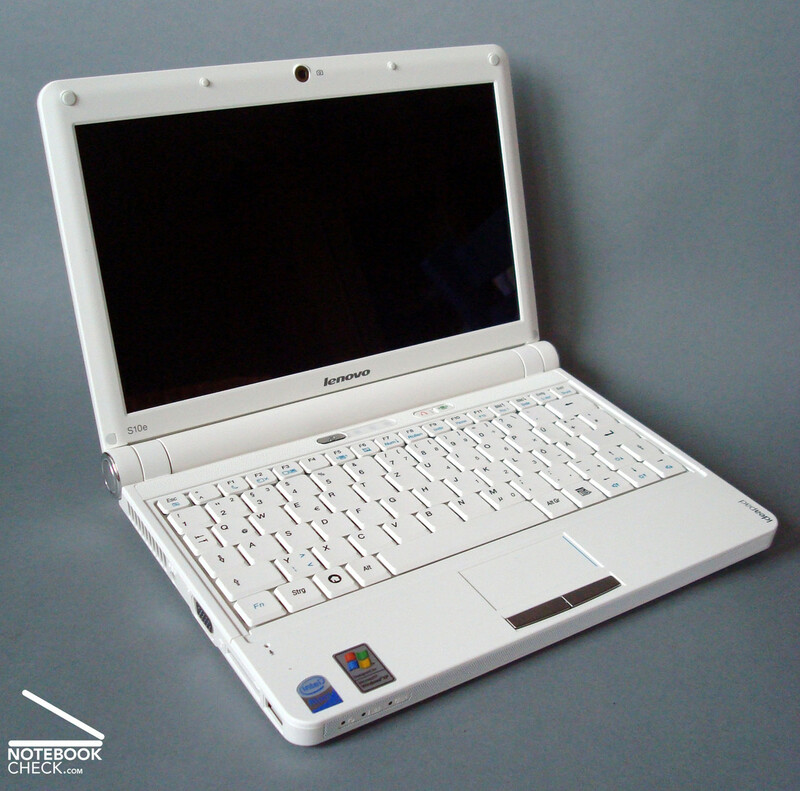 Pros are the generally good workmanship, the robust case, the exemplary maintainability of hard drive and RAM, the ExpressCard/34 slot, which is rare in netbooks, the overall rather complete equipment, and the good noise and temperature emissions, which are at the same level than competitors. With prime costs of about 360.- Euro at the time of writing and 12 month manufacturer warranty, the reviewed model of the Ideapad (NS84XGE) is average in price. This also matches the average total picture. Many thanks to the company Cyberport.de, who kindly provided us with the test sample. 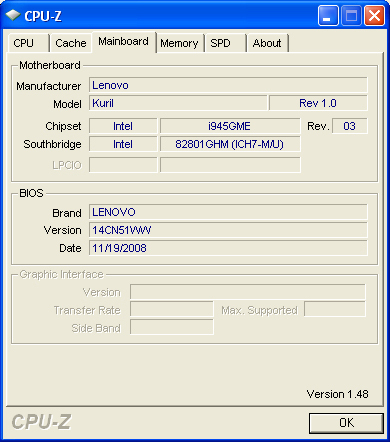 Here you can configure and also buy this laptop. Ethernet close towards the back, so cable does not disturb, Kensington lock in the hinge. Small touchpad with stiff buttons. - Keyboard layout needs time to get used to. Easy upgrade and expansion via ExpressCard/34 slot are exemplary. A display appropriate for outdoor operation. You will get very much for little money with this small mini-notebook. The competitors like Asus Eee PC 1000H and Samsung NC10 are clearly better than the Ideapad S10e in important key aspects, display and battery life, but loose in expandability.